At the stroke of midnight on December 31, 1999, airplanes would fall out of the sky, computers would implode, the moon would turn blood red and you’d forget where you put the car keys. Most of that didn’t happen, BTW. Now we have GDPR, and some people and many businesses can be found on the spectrum of uneasy-to-anxious-to-panicky. The new General Data Privacy Regulations are in effect as of May 25, 2018, in Europe, and seem likely to be followed everywhere else – eventually. Don’t panic. In fact, this is a good thing. 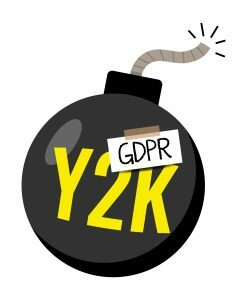 GDPR will protect the privacy of millions of people, including two really important ones: you and me. But is it good for businesses? There are some harsh penalties attached to violations after all. The answer again is yes. GDPR offers a positive benefit to responsible organizations to affirm trust – it says we’ll handle sensitive personal data responsibly. Brands need to be trusted. Brands need to be trusted. Brands need to be trusted. So if you are an American business, what should you do? First, get ahead of the curve: pretend, in an abundance of caution, that GDPR is law here, too. Comply. If you do business in Europe (as we sometimes do) this becomes a bit more urgent. You need to get double-opt-in permission from subscribers or anyone who’s information you retain, make changes to your Privacy Policies (here’s ours for example) and whatever else your lawyers may recommend. GDPR, for example, gives EU/EEA citizens the ability to ask to delete all their data from all servers and all data collection locations. We like that courtesy, and give that option to all our subscribers, regardless of citizenship. Europe isn’t out to get you. Those giant fines are there to persuade Google and Facebook and other giant firms to get in line. Always look on the bright side: GDPR raises the expectations of your customers and prospects about your stewardship of their information. It’s an opportunity to be a good corporate citizen. Look back three paragraphs, the part about your brand and trust. We are not lawyers (and, as the saying goes, our other habits are good) but if you want help getting your digital presence updated so your brand can be trusted, we’re at your service. Our available times to talk are here.